The Gates Foundation does a lot of good in the world — so why are they investing in evil private prison corporation The GEO Group? Tell Bill Gates to stop investing in GEO Group! 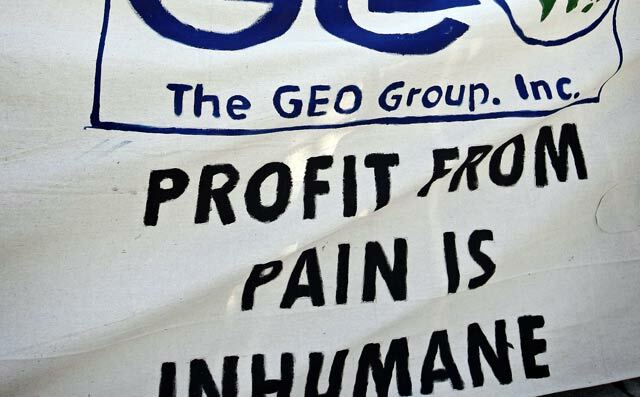 GEO makes a business of jailing those with the fewest resources, profiting from their labor, stripping them of their dignity, and leaching precious human capital from already-distressed communities. If enough of us speak out, we'll be able to create a powerful media narrative that exposes this contradiction and shames the Gates Foundation Trust to withdraw its investment. Join Presente, Enlace, and 25 other organizations2 in calling on the Bill and Melinda Gates Foundation Trust to immediately withdraw its investment in the GEO Group. When we learned of the Gates Foundation Trust's investment, we reached out to Bill Gates directly, sending a letter signed by leaders of Presente, Enlace, and 25 other human and immigrant rights groups. But we received no response after more than two weeks. GEO Group and other private prison companies have a perverse profit motive to drive criminal justice and immigration policy towards more incarceration of citizens and immigrants in prisons, jails, and immigrant detention centers. They spend millions of dollars — dollars provided in part by investors like the Gates Foundation Trust — lobbying local, state, and federal governments to institute longer sentences, to incarcerate more people for minor crimes, and to terrorize immigrant communities. What's more, GEO Group has included 80% to 100% occupancy guarantees in its contracts for jails, prisons, and immigrant detention centers that incentivize the criminalization of marginalized communities and put taxpayers on the hook for guaranteeing GEO Group's profits. We recognize the good that Bill Gates does in the world, and we recognize that earning a return on his investments is a key part of how the Gates Foundation Trust funds its efforts to change the world. But none of their good deeds makes financially enabling GEO Group less harmful to America's immigrant communities. That's partly because in order to keep its profit margins healthy, GEO cuts corners on caring for prisoners, denying proper nutrition and rehabilitative services. GEO Group even skimps on staffing and security in its facilities, putting inmates, detainees and its own employees at risk of dehumanizing violence. In light of this evidence, it is shocking that the Gates Foundation Trust would maintain its investment in the GEO group. Many of the families and communities that represented by Presente, Enlace, and the 25 other organizations who signed our letter to Bill Gates bear the brunt of private prison corporations' predation in poor and minority communities every day. By lifting up their voices and telling their stories, we can shame the Gates Foundation Trust into doing the right thing. It has worked before — as a result of massive public pressure, the Gates Foundation withdrew from the American Legislative Exchange Council, an organization that promotes harmful legislation like the so-called "Stand Your Ground" laws that led to the deaths of Trayvon Martin and Jordan Davis.5 We can achieve the same results. Please join Presente, Enlace, and 25 other organizations in calling on Bill Gates to divest from GEO Group Immediately. 1. The Gates Foundation's Hypocritical Investments. Mother Jones, Dec. 11, 2013. 2. Gates Foundation Sign-On Letter. Presente.org, Mar. 10, 2014. 3. "Miss. Prison Operator Out; Facility Called A 'Cesspool.'" NPR, Apr. 24, 2012. 4. "750 Detainees Go On Hunger Strike At Immigration Holding Center In Washington State." Reuters, Mar. 10, 2014. 5. "Gates Foundation Will No Longer Make Grants to ALEC Nonprofit." Roll Call, Apr 9, 2012.